Northern Neck Waterfront Property Searching, You are the Captain! For anyone who has never participated in a serious house-hunting effort, their mental image of how the experience will unfold may be a little off. They might imagine that, after narrowing down their requirements for a Northern Neck waterfront home home (size, price range, and the like) they will agree on a day and time, then just climb into their Northern Neck Buyer agent’s car and settle back to have the likely prospect properties exposed before them. Experienced Northern Neck property searchers have learned to husband their energy on any day that includes home showings. Especially when their property search doesn’t immediately yield a find that fits their target criteria, they know that it may take a while—and more than a few house-hunting outings—before they identify a suitable house. But that stress can dramatically reduced by searching for Northern Neck Real Estate before you ever meet your Northern Neck Buyer’s Agent. That’s why more experienced prospects know from the outset that a home showing isn’t a passive experience. It’s not a bad idea to have a pen handy for jotting notes on the listing sheets the Northern Neck real agent provides—notes about distinguishing features (good and bad!) that will help with comparisons at the end of the day. For those who are veterans of previous Northern Neck waterfront property searches, this is old news: they remember reviewing sessions that include, “No – that was the one with the pier and boat lift, not the one with the expansive views.” For first-timers, it’s good to know in advance: a waterfront property search is a participation sport. And you’re the team captain! If you begin a search for a new home by going online to check out the Northern Neck real estate listings, it’s likely that one of the first search criteria you enter will be the price range. After all, unless you are a virtual looky-loo who is just checking out how the other half lives, your budget will dictate which homes you seriously consider. If you are one of the more than two-thirds of us who will be counting on a loan to help finance that home purchase, the monthly payment amount is really what matters. For a quick example, suppose you were Average American Homebuyer taking advantage of an average American home purchase just this past July. Your family income was a bit higher than the median of $55,000—say, $60,000—so if you went with the lenders’ standard rule that 28% of income is the most a housing budget should allow, that meant $1,400 would be your maximum mortgage payment. But remember, this quick example is one that required you to sit down. Sooooo — what’s the problem? It’s this talk about the Federal Reserve wanting to raise the federal funds target rate. That would have to trigger rises in the mortgage interest rates in the Northern Neck (and everywhere else). In our quick example, taxes and insurance costs stay the same; but suppose the mortgage interest rate notches up one little percentage point, to just 5.05%? That’s still below the historical average, yet the same home—and the same loan except for that one percent raise—now requires a monthly $1,486 payment. That crosses the budget recommendations—and although some lenders would likely consider other factors that might make the loan possible, that single percentage point rise does wind up costing Average American Homebuyer more than $1,630 a year (and nearly $50,000 over the life of the loan). The reality is that prudent home shoppers are currently able to consider properties at higher price ranges than will be the case after mortgage interest rates rise. For them, the market is literally wider than it will become later. A further note: August saw local mortgage interest rates fall below even July’s 4.05%. Another very good reason to give me a call and let me help you find that perfect piece of Northern Neck Real Estate for you. If you’ve never been involved in selling a home before, you may be surprised as to how much paperwork is involved. Dozens of documents need to be reviewed, and dozens more need to be duly signed and notarized to make them “official”. What really surprises my Northern Neck Real Estate first-time sellers is the disclosure aspect of the sales process. Many first-timers are shocked by the numerous open-ended queries involving issues and events you may not have even considered significant (and some even from times before you acquired your Northern Neck Real Estate home). Believe it or not, many of the Disclosures/Questionsare required by law to prevent any future lawsuits between you (the seller) and the home buyer. any alterations, modifications, remodelling, replacements, or material repairs on the property? the release of an illegal or controlled substance on or beneath the property? an order from a government health official identifying the property as being contaminated by methamphetamine? any renovations of lead based paint surfaces completed in compliance with the EA lead base paint renovation rule? past or present odors, urine, faeces, discoloration, stains, spots, or damage from pets? diseases or infestations affecting trees, plants, or vegetation on or near the property? fill (compacted or otherwise) on the property or any portion thereof? financial relief or assistance or settlement, sought or received by past or present owners of the property, due to any actual or illegal damage? If you do come across their types of questions, don’t feel singled out – you’re not being targeted for anything you’ve done. Many of the Disclosures/Questionsare commonly used throughout the state and apply to most Northern Neck Real Estate home sales. If you are selling Northern Neck waterfront real estate there could be even more questions. Wondering about other surprising aspects of the home sale process? Give me a call (804)366-2325 and I’d love to walk you through everything involved. We’ll get through this together! Been waiting for an affordable waterfront retreat? If so then this 3 bedroom waterfront home priced at $259,000 is one you should put on your list to see. Amenities include swimming pool, tennis court, clubhouse, and more. Now they are the community amenities but this Northern Neck waterfront property offers a pier with boat lift. Catch crabs from the pier, steam ’em up and then enjoy them on the screen porch looking out over the water. Close to local seafood restaurants if you don’t want to make the short run out to the Bay and catch your own. Sitting on 1.6 acres with established landscaping and very little grass to cut giving you the maximum time to relax and enjoy. At this price it’s going to attract a lot of attention so please don’t wait. Remember you can always search for Northern Neck Real Estate or contact me and let me know what you are looking for. About 2 weeks ago the weather broke. Today everything is in bloom and the temperatures are pleasant. I can gauge pretty well what my clients are doing by the activity to my website. Usually Sundays are the slowest days but not yesterday. Yesterday 498 pages were viewed. That tells me one of 2 things. First warm weather brings on thoughts of the river or two that it was such a pretty weekend people visited the Northern Neck and then went home and visited my site to learn more about the properties they might have seen. I really built my website for my clients’ convenience. All the properties have their address shown and in today’s world of GPS it gives them a chance to explore the Northern Neck at their pace. I built it so you can search for property with all kinds of detail or you can do a quick search which is on the right hand side of every page. I think one of the most useful tools is the map search but it is the least used of all the tools. Say you like a particular area and you want to find properties in that area. All you have to do is position the map in that area, enter the basic criteria, and then click on refresh. Don’t like what you see or have another area you are interested in just move the map and hit refresh, HOLA! As you look at the map due North is to the top of the page.Check it out. It could save you a lot of driving time by seeing things in order and not driving from address to address. Remember you can also zoom in or out on the map. If you know little about the Northern Neck then call me or make an appointment and we’ll take a tour. You can learn a lot in a couple of hours and it will be fairly leisurely as we will have no time schedule to follow. I can tell by the traffic to my website that people are tired of cold weather and thinking of warmer times as they search for Northern Neck Real Estate. Well I couldn’t wait for warmer weather and 2 weeks ago I jumped on my motorcycle and headed south. I got out just in time. I feel sorry for you guys that have gotten blasted but I’m glad to be where I am right now. I’ve been having a great time and posting a lot to Facebook so family and friends could see what I’ve been up to. Do you remember when the way you did that was with a postcard? Life’s good. Beautiful sunset, isn’t it? Well it might be for sale here shortly. I was told that I would know by March 1. It is on the Rappahannock, has 4 bedrooms, pier with lift, lots more. If you have an interest I’ll shoot you an email before it goes into the MLS. If you don’t tell me I won’t know so email me and that will give you a little bit of a jump over the others looking for Northern Neck Waterfront. Hope it warms up soon and when it does let’s look at some Northern Neck property. The real estate market here in the Northern Neck never sleeps. 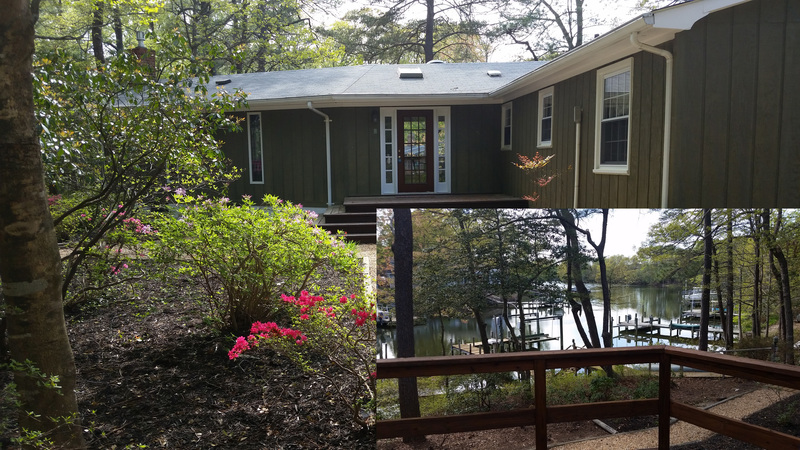 During Thanksgiving week 5 new Northern Neck waterfront homes were added to the Northern Neck MLS. None of these for you? Then search for Northern Neck Waterfront Homes or search all (non waterfront, lots, everything) Northern Neck Real Estate. If you see something you like then give me a call. The time is coming that we all give thanks or should I say that we reflect on those things we are thankful for with family and friends. As many of you know this year was a medically challenging year for me but everything is good now and I’m thankful for all of you that kept me in your prayers. Thank you. I’m also thankful for and grateful for the the relationship we have built. As most of you know I’m not pushy, don’t brag about my accomplishments but instead I’ve tried to build a trust. Again I am truly grateful for the relationship we share. Remember you can also search the Northern Neck MLS and when you find that special property please feel free to give me a call or shoot me an email. Have you been searching for a waterfront home but can’t find the right home or the waterfront lot does not fit your needs? This newly listed 2 acre waterfront lot might might be your answer. Centrally located between Kilmarnock and Reedville with deep protected water and moments from the bay Cranes Creek Harbor is one of the Northern Neck’s premier developments. As you drive into Cranes Creek Harbor you view out of the creek through the Great Wicomico River and into the Chesapeake Bay. On the left side are waterfront homes and lots that were developed from the land that was once farmed. On the right side many of the lots are wooded and those homes are privately hidden among the hardwoods and hollies. This lot is one of those that is wooded with over 460 feet of shoreline and the house can be situated so that the main view looks down the creek with other views looking across the creek. Search for Northern Neck Real Estate. I live in Northumberland County and am pretty centrally located in the county. I can be anywhere in either Lancaster or Northumberland County in 20 minutes or less. Earlier I sent you 19 properties in the Kilmarnock, Irvington, Weems, and White Stone areas that had been on the market for over a year. These 19 properties are Northumberland County waterfront homes that have been on the market for over a year. Again they are ones that I randomly picked and did not include any that were over a million. Although in live in Northumberland I do most of my shopping in the Kilmarnock area (15 minutes away). Usually you can find a comparable home in Northumberland for less than in the Kilmarnock area and the property taxes are lower as well. Remember you can search for Northern Neck Real Estate any time and if you want more information or the history of the listing (days on market, price changes, etc.) just email me.